The Support Programme at St. Augustine’s Centre provides practical and emotional support to anybody who walks through our doors. We welcome everybody regardless of race, gender, national origin, ethnicity, religion, disability, and sexuality or immigration status. We believe everybody is individual and the way we work reflects this. We take a person-centred approach, taking the time to get to know people; their strengths and interests, as well as their needs and the barriers they want to overcome. We have been helping people for many years and have built up lots of experience, in particular, in working with asylum seekers, refugees and other migrants. Under the Support Programme we provide a holistic service, meeting the varied needs of the community with which we work. This includes a safe welcoming space, offering friendship and solidarity at the Welcome Café; a range of free English classes for all abilities; health and therapeutic wellbeing support; sports and social activities; education and training opportunities; help with gaining employment; practical advice and advocacy for asylum seekers and refugees; and help with benefits, welfare and housing. You don’t need to be referred to the Support Programme, everybody is welcome, just come along to one of the activities. If you want to talk to someone before attending, or you want to refer someone else please call or email us with a message and someone will get back in touch with you. We know that claiming asylum can be a lonely, confusing and traumatic experience. Under the Welcome Programme we provide practical and emotional support to help new asylum seekers to Calderdale feel welcome, orientated and settled-in. At present, we do not have an immigration advisor at the Centre and therefore cannot give immigration or legal advice or help with visa applications or other immigration matters. If you are in need, we will always try to find another organisation who can help. Our Housing Programme is set up to provide individually tailored support and advice on all issues connected to housing. We work with people in lots of different situations who are experiencing problems with their housing, especially people who may struggle to obtain or manage their tenancies due to language barriers and a lack of familiarity with UK processes and structures. In particular, we are experienced in assisting new refugees who have recently received a positive decision on their asylum claim and are in transition from asylum support to mainstream rented accommodation. Our New Home training programme promotes independence and teaches people the skills they need to manage and sustain their own tenancies. This includes sessions on setting up utilities, paying bills, changing addresses, managing waste and recycling and tenant’s rights. Look here for our current training timetable. The Welcome Cafe is a social space in the Community Building running Monday – Thursday from 10am until lunchtime. Everyone is welcome to socialise, read a newspaper, use the wifi, play a game of chess or sit quietly over a cup of tea. We advertise and promote lots of social activities through the Welcome Cafe so it’s a great place to get plugged in with what else is going on in the local community and across Halifax. The Community Lunch is cooked by a team of volunteers. When lunch is served our students, volunteers, visitors and community members all sit down together for a delicious meal from around the world. For many people, this nutritious meal is their only hot meal of the day. We welcome donations for the community lunch, but there is no obligation to pay anything. If someone wants to do an activity that is not already provided, we will try to help them access it. Under Calderdale Valley of Sanctuary we work with community groups to help them become more accessible and welcoming to new arrivals. The advice drop-in is an independent, community service providing free, impartial and confidential advice every Monday to Thursday mornings in the Support Building. The advice drop-in is the first point of call for support from the Welcome Programme, Housing Programme or Employability Programme. We arrange afternoon appointments for complex issues that can’t be dealt with during the drop-in and can visit people at home if required. We use volunteer interpreters wherever possible or you can bring a trusted friend. We are really proud of our extensive and unique, volunteer-led ESOL programme. Our English classes are open to all, run on a drop-in basis in the Community Building, with no need to pre-enrol or pay. We provide 8 English classes per week catering to the differing needs and preferences of our learners. There are simple conversation classes, classes specifically for Arabic speakers, lively games and craft focused sessions, more formal literacy classes for beginners and improvers and smaller classes at a more advanced level. We can also offer 1-2-1 tuition for learners needing to pass the IELTS academic exam, in order to go to University or take up professional training. We work closely with Calderdale College, preparing students to enrol once they have been in the country the requisite 6 month period. In 2016 we found that 82% of the learners we spoke to reported an increased level of confidence as a result of attending English classes at St. Augustine’s Centre. The classes provide more than tuition, they fulfil a huge social need in providing daily structure and routine and somewhere purposeful to come and meet friends. This, of itself, is of immense value to our learners. Look here for our current timetable. Our Employability Programme is open to everybody who wants help to improve their skills, look for training opportunities and find work. We want to help people find work while helping them continue to develop their skills, explore their aspirations and plan for a bright future. Create and improve your C.V.
We see people at the Job Search Drop-in on a first come first served basis. We are very busy so arrive early to make sure you are seen! If you are ready to start doing your own independent, online job search, come along on Thursday mornings, when the computer room is open with assistance on hand for guidance. We run a programme of training courses to help with confidence building, learning new skills and increasing knowledge and understanding of the UK work environment. Regular training courses include: 5 week Interview Skills, Practice for Driving Theory Test, Assertiveness Training, UK Life (practical knowledge and skills) and Computer and IT skills (mixed and women-only provision). Get in touch with the Employability Programme Coordinator or come to the drop-in to find out about upcoming training. Our Employability Programme Coordinator and team of trained volunteer advisors can also help people with finding worthwhile volunteering opportunities, work placements and external training courses to gain experience, skills and references. We also offer 1-2-1 mentoring for career and educational-path advice, assistance with written job applications and preparation for interviews. Asylum seekers are not allowed to work and many have no recourse to asylum support or public funds and are left without any way of providing for themselves for prolonged periods. This might be due to administrative and system failings, or because their asylum claims have been fully refused (although they might not be able to go back to their home country). Destitute asylum seekers are incredibly vulnerable and marginalised. Many are homeless, either sleeping rough or sofa surfing, and surviving on help from friends and charities. They often also struggle to access adequate healthcare, advice and social support. Under the Destitution Project we provide practical advice and ongoing support to help people out of destitution and access the help they need to resolve their problems. Our provision includes: a hosting scheme where a volunteer host/host family accommodates an individual for a set period of time; emergency provisions and toiletries; donated clothing; small cash payments for travel to important appointments; and social and emotional support through wellbeing activities and pastoral care. We work in partnership with the British Red Cross, and networks WYDAN (West Yorkshire Destitute Asylum Network) and NACCOM (No Accommodation Network) to stand in solidarity and campaign for change with people experiencing destitution as a result of the asylum system. If you want to find out more or need assistance from the destitution service, please get in touch or come to the advice drop-in. We offer a stimulating and caring environment with qualified staff whose aim is to treat children as individuals, supporting their development and educational needs through play in a safe and friendly context. We are OFSTED inspected, operate an equal opportunities policy and welcome all members of the community. We have a team of qualified experienced staff, a number of whom are bilingual. The Nursery has space for 25 children, both morning and afternoon, with a staff to pupil ratio of 1:5. This ensures that each child receives individual attention and that their needs are met. The Nursery is open during term time, 5 days a week. We run 2 sessions a day – am 9.00 – 12.00 and pm 12.30 – 3.30, with places for 25 children at each session. We operate an equal opportunities policy and welcome all members of the community. 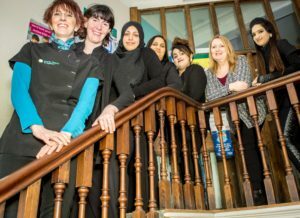 We have a highly qualified and experienced staff team, a number of whom are bilingual, speaking Punjabi and Urdu. We have a good staff to pupil ratio which ensures that each child receives individual attention and that their needs are met. We offer a stimulating and caring environment with staff treating children as individuals, supporting their development and educational needs through play in a safe and friendly environment. We advise and support parents and encourage them to be involved in their child’s learning using a range of activities including Parent and Child learning sessions, Open Days, ‘Activities @ Home’ sheets and take home bags. We also send out a half-termly Newsletter to keep parents up to date with what is happening at Nursery. With families returning again and again with their younger children we must be doing something right! We use the ‘Tapestry’ online Learning Journal to document children’s learning and development which is well liked by parents and staff. Our intake for Nursery is very diverse, this can mean children starting with very little or no English, but with the hard work of the staff we are seeing huge improvements in the development of children’s language skills and their use of English. Our most recent Ofsted inspection was in March 2014 with an outcome of ‘Good’ with elements of ‘Outstanding’. For more information or to enquire about a place for your child please contact the Nursery on 01422 352492 or via email at karen.hammond@staugustinescentrehalifax.org.uk or carmen.marson@staugustinescentrehalifax.org.uk. We are always happy to deliver talks or training to other organisations, charities, schools or community groups. Please do get in touch if you’d like more details.